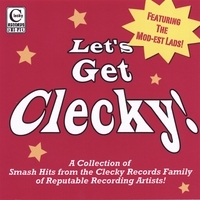 Clecky means eclectic, and when you hear the Clecky Records Family of Reputable Recording Artists, you'll know why everyone calls "Let's Get Clecky" the most eclectic collection of hit sounds ever captured on one disc. Lavish praise indeed, but when you hear this collection of hits by the Clecky Family of Reputable Recording Artists, you will instantly understand why the hyperbole is not just a lot of overblown exaggeration! Named one of the Ten Worst CD Covers of 2006 by cdreviews.com! And be sure to check out "Trouser Load of Love" by The Mod-est Lads at http://cdbaby.com/cd/modestlads! Holy smokes! Loved this CD! "...You can't hurt a Polack by hittin' him on the head" This superb Polka should be a MANDATORY song at every Wedding! Too stinkin' funny! and "...The Rooster named Ted..." funniest damn song in the 21st century. How can you go wrong with yodeling and a cow stampede in a bar?? COME ON! excellent!